Ever feel like a doorman for your dog? In-out, in-out. You no longer need to let your dog in and out with a wall mount pet door. 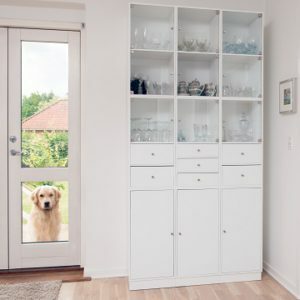 This magnetic dog door can offer you security that no one can get through the door except your dog when they are wearing their special dog tag. Your dog can control when the door goes up for them to get outside, or come back in when they have had enough. With an magnetic dog door, your dog can let himself in. No more worries if you get home late from work that your dog had an accident in the house, and no longer getting up in the middle of the night to let your dog out. Once they are trained to go through this dog door, they can let themselves out. This automatic dog door will lock behind your dog every time they go through the door. The Solo Pet Door has been manufactured in the United States for over 25 years, and provides one of the best automatic pet doors available. Ease of operation and security are the biggest concerns with a doggy door. You want your dog to be able to get through the door when needed, but you also don’t want other animals or people getting through the door. This smart dog door only allows your animals through the door that are wearing the special magnetic dog tag. It locks each time your dog goes through the door. It provides better weather protection than flap dog doors, completely sealing off the outside elements. The Solo dog door is available for wall mount or door mount. You just need to specify at the time of ordering the type of installation you are planning. The exterior is made of bronzed, transparent lexan and framed in a sturdy, dark black, anodized aluminum. The interior trim plate is made of white textured acrylic, which can be painted if you want to match your wall color. You can order black interior trim if you so desire, but all exterior trim is black to hide dirt. The system operates on 120 volts, which is standard in the United States. A power cord comes with the door, but if you are installing as a wall mount pet door, you can order internal hard-wiring for your electrical connection, which is recommended for wall installation. This dog door is electronically activated by a pet wearing the included pet tag. It is a magnet and no batteries are required, making sure your dog never gets locked out. Also, waterproof for those swimmers out there. Simple attach the pet tag sensor to your pet’s collar. You can adjust the distance to activate the door from 0 to 5 feet away and adjust how long it remains open from 1 to 5 seconds. 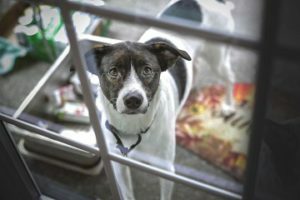 The more familiar your pet gets with the door, the less time it will take them to navigate through the door, and you can readjust after your dog understands the dog door more. This automatic dog door is safe for your pets. The door closes slowly using only gravity to bring it down, so it would just gently touch your pet if they were going slowly through the door and wouldn’t injure them. The door lifts and lowers vertically. Timing and sensitivity adjustments are mounted inside, so no one else can make changes to your system. There is also an on/off switch inside which is great when you want the door to remain closed. The dog door insures that you will have a proper sized door for your dog by proving 10 sizes to fit the smallest of dogs or cats to providing an opening for even the largest of dogs. The larger the door, the larger the price tag. 10″ high x 8″ wide, 12″ high x 10 wide, 15″ high x 10″ wide, 15″ high x 14″ wide, 18″ high x 12″ wide, 20″ high x 14″ wide, 24″ high x 12″ wide, 26″ high x 14″ wide, 30″ high x 14″ wide and 36″ high x 14″ wide. Measure from the top of your pets’ front shoulders to the floor and that will be the proper height that your dog will need. Measure the width of your dog’s widest part. This will either be the front shoulders or the rear hips. The goal is to make the door as small as possible without making it too small for your dog to get through. Order a size to fit your dog as they age. An older dog with arthritis or joint pain will have a harder time getting through a small opening. The overall unit height will be twice as high as the pet opening. Take that into consideration if you are using a door mounting unit and you have glass half-way down your door. Depending on the size of the opening you need, it might not fit on a door with glass. When you first install your new automated dog door, your dog won’t have a clue how to use it, and might be a bit afraid at first. You will need to work with them to start using their new entry into freedom. Keep the motor off when training your dog and keep the door propped open. Go outside and call your dog through the opening. Using their favorite treats always makes the training easier. Repeat this process from outside to inside. You will have to work with them for them to feel comfortable. Once they are easily moving in and out of the door, activate the motor and close the door. This will probably work best if you can train with 2 people for this part. Get your dog to approach the dog door that will now automatically open for them now. With someone outside, use treats to get them to go through the door. Repeat these steps several times until your dog is understanding the freedom that the door is going to provide for them. This product can be installed by homeowners or handyman. For wall mount installation, measure wall thickness. If distance is 6″ or less, no tunnel extension is required. If distance is 6″ to 8″, a 2″ tunnel extension is required. Greater than 8″, a 4″ tunnel extension is required. If extension is required, order at the time of purchasing the dog door. A wall installation has the unit completely installed inside the wall. If you get a door mount unit, it will work on insulated metal skin doors, wood doors and fiberglass. It makes no difference if your door is flat or has raised panels on the door surface. For larger dogs, install the dog door 4″ to 8″ off the ground to make it easier for them to step through. Take into consideration that older dogs will have a harder time stepping up higher. If you have more than 1 dog, just order an additional sensor tag at the time you place your order. The tags come in 3 sizes and require no batteries. Small for dogs under 15 pounds and cats, medium for dogs weighing 15 to 50 pounds or large for dogs weighing over 50 pounds. No longer will your dog be staring at you to let them in. Remember, only pets that are wearing their own individual tag can open the door. You might want to order an additional tag even if you only have 1 dog, in case your dog loses their tag or collar. The Solo Pet Door is completely secure, but if you feel you need additional protection, it is available to order with a built-in intruder alarm as an optional feature. The Solo wall mount pet door can provide your dog the freedom to go out and come in when they want. Giving your dog more fresh air and playtime in the yard. You no longer will have to get up to let your dog out and keep an eye on the door for when they want to come back in. This will also help with dog boredom when no one is around. The magnetic dog door uses a magnetic dog collar that will only operate for your pets that are wearing the tag on their collar, and will always be locked in the closed position. Providing security from unwanted guests, and providing protection against the weather. The Solo Pet Door has a 1-year warranty from the date of purchase to be free of manufacturer defects in workmanship and materials, but this product should last more than 15 years. Order your automated pet door today and relax while your dog goes in and out as they please. If you have any questions or comments, please leave them below. You can follow justforyourdog.com on Pinterest, FaceBook or Twitter for all the latest updates.